Wall Chat Wednesday is back! 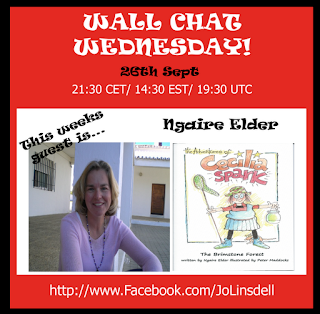 Today's special guest is children's author Ngaire Elder. Join me on my Facebook page today at 21:30 Central European Time where I'll be joined by Ngaire Elder to talk about her children's book series "The Adventures of Cecilia Spark" and get an insight into her thoughts on book marketing and writing for children. If you have your own questions for Ngaire please feel free to post them directly to the wall.